A Large Collection of Decorative French Carriage Clocks to Be Sold On Behalf of the Collector. 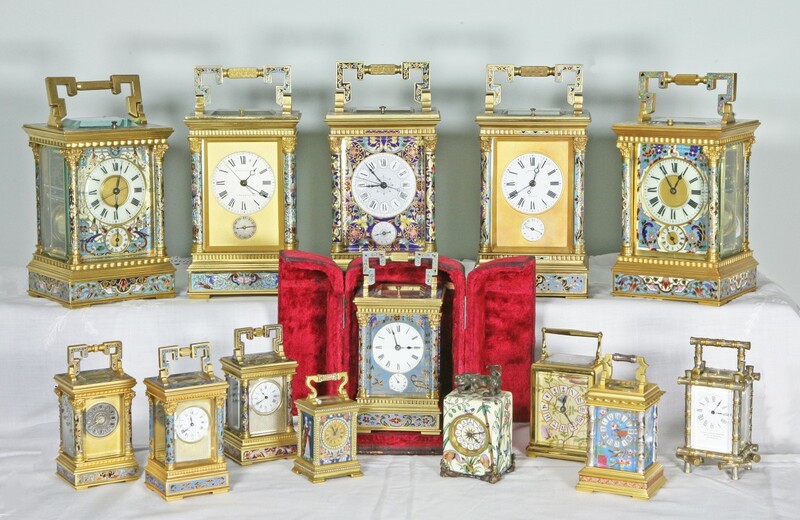 Some of a large collection of extremely decorative standard size and miniature carriage clocks. The majority with champlevé decoration and many with centre sweep seconds dials and grande sonnerie striking. A number in the Oriental style. Please contact us for further details, pictures and the price of any clock which is of interest. It is extremely rare to be able to pick your particular favourite from such a large collection of fine decorative carriage clocks. In addition to those shown in the picture, there are a number of similar carriage clocks available and so if one of the clocks is almost what you want, but for example you would prefer a lighter or darker colour in the champlevé enamel, it is worth contacting us. We have detailed pictures of each carriage clock which can be sent with a full description to any interested party. NB: A number of these clocks have been sold.